"In 1856, the residents of South Reading voted at the annual town meeting to establish the town's first official library. 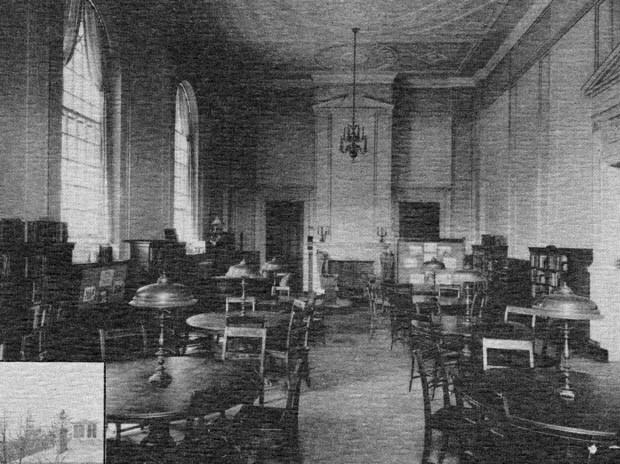 With an annual budget of $300 for both the purchase of books and the librarian's salary, the library's first 'home' was in the old Town House at the head of the Common. During the first six months in operation, 4135 books were borrowed by the town's 3000 residents. Then in 1868, the library was moved to the newly erected Town Hall at the corner of Water and Main Streets. After a generous donation of $500 from Library Board Chairman Lucius Beebe, the library was renamed the 'Beebe Public Library.' By 1909, the library was lending over 50,000 books per year. As a result, in 1916, over 1200 residents, many of whom were school children, raised $12,000 to buy a parcel of land at the corner of Avon and Main Streets to erect a new library. 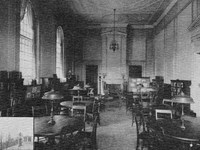 During the Christmas holidays that same year, Junius Beebe donated the funds necessary to erect a new library in his parents' memory. Construction on the library was delayed until the end of World War I and on March 17, 1922, the cornerstone for the Lucius Beebe Memorial Library was laid in place. The library was officially opened on April 16, 1923 and during the first year of operation the library lent nearly 115,000 books. In 1964, the library had again outgrown its quarters. The Board of Trustees requested and received an appropriation from the town's funds to finance the construction of an addition to the original building. On September 14, 1969, the addition was opened to the public. T oday the Lucius Beebe Memorial Library is an educational, cultural, and recreational resource for Wakefield residents of all ages. Residents may use over 80,000 books, records, and cassettes in the library's collection and have access to 400,000 more items through the computerized North of Boston Library Exchange (NOBLE). During 1985, over 180,000 items were lent to community residents. In addition to traditional library services, the library offers story hours, s;Captions: 1. The Lucius Beebe Memorial Library in its early stages. -- 2. 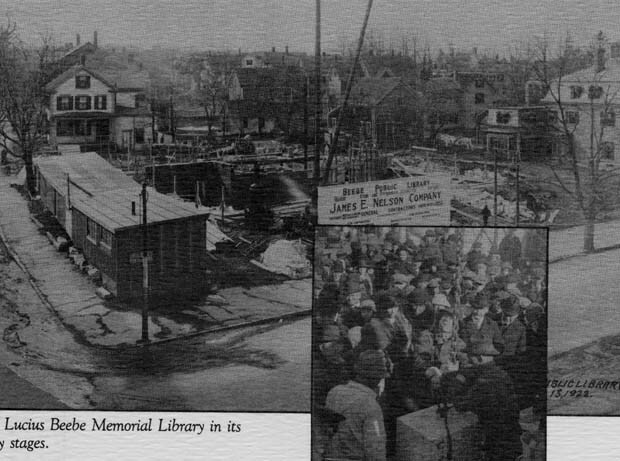 Laying the cornerstone of the Lucius Beebe Memorial Library on March 17, 1922. -- 3. Library's Youth Room. “Library,” NOBLE Digital Heritage, accessed April 20, 2019, https://digitalheritage.noblenet.org/noble/items/show/7006.